I have purchased a rather large bag of long-grain white rice (25 lbs.) and need to know the best way for storing it long-term. This rice will be used as both a food-storage food source and as my everyday source of rice for cooking, so the storage solution should (hopefully) be resealable, rather than once-it's-open-it's-open. I eat rice maybe three times a month, so it isn't really "everyday" but it will be my go-to when I have it. If you are only using it three times a month then this 25lbs bag may last a very long time indeed. The problem is that even white rice can eventually develop off flavors when exposed to light and air. Additionally- even if pests don't have access to the rice, it is not unlikely that the rice has some eggs on it that can hatch and spoil the whole bag. The solutions to these problems all make it difficult to use the rice in the short term. For long-term food storage dry foods are typically sealed in either #10 cans or mylar bags. An oxygen absorbing packet is also included. This will prevent spoilage and pest growth. Mylar bags are less expensive and you can open one bag at a time for short term use. Alternatively- if you can freeze the rice to ensure there are no pests then the rice can be stored, sealed, in a cool, dry place as others have described. Given how cheap rice is- it might be acceptable to you to just take your chances and replace it if it spoils after some months. Here in China, I have a special rice box. It's basically a plastic box with a lid. The lid is not completely air tight but is a neat fit. This allows the rice to remain dry without any pests getting inside. 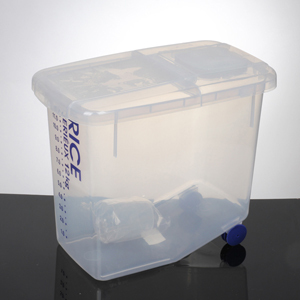 You can also get special electronic dispensers that will store the rice and measure out portions for you. The one pictured below stores 25kg of rice. If you can't find these at local suppliers, look on sites such as taobao.com (Chinese) or alibaba.com (English) you'll find many suppliers who will export from China to you. There are food-grade storage buckets with lids that can be found at restaurant supply stores or online. 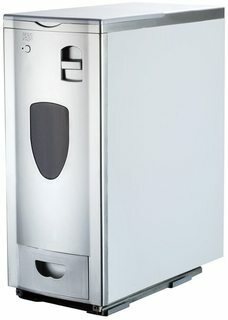 They work well for storage of many kinds of bulk items. They come in various sizes so you should be able to find one that fits your need. I buy my rice in large sacks too; when I get home, I portion it into gallon-size heavy duty, double zipper, Ziploc Freezer bags. I add an oxygen absorber (a small iron oxide packet) to the top, and when closing, I leave a gap at the end of both zippers and fold it to expel the air before closing. They go into an airtight storage tote (to keep the rodents and insects out). Ziploc also makes resealable vacuum bags, if expelling the greatest amount of air without expensive equipment is desireable to you. I use the last bag, which is often not completely filled, for daily cooking, in the kitchen cabinet. It has the most debris so I rinse the rice from this bag a couple more times than usually. When the bag is done I just bring up the next. I have stored rice for up to a year and a half this way without any noticeable decline in quality. (Rice is my go-to staple as well as I'm celiac, and I'm quite picky about how it tastes and feels.) This is a mid-term storage method, but it seems to be what you describe; long-term can mean storing the rice untouched for years, as if it were buried awaiting some post-apocalyptic scenario - in which case mylar, heat-sealing, and airtight metal cans like described above might be better favoured. Soda bottles - you've probably got them already, they stack well, they seal airtight and it reduces the chances of one bad grain spoiling your whole sack. I stored some rice and beans to have ready incase something was to happen I would be prepared for my family. After a lot of research I found my way to be over kill but its what keeps me at ease. I purchased 5 gallon mylar bags with the proper oxygen absorbers. I also purchased several food grade buckets in bulk for a lower price. 1) I store the rice in my mylar bag which is placed in my food grade bucket. 2) I place in my oxygen absorbers one at the bottom and one at the top of the bag. 3) I iron the bag but leave just enough space to fit a vacuum hose in to remove air. 4) after I use the vacuum I iron the bag completely shut. Use iron at the high setting and make sure you use a flat surface like a chopping board or a book. The absorbers will get any remaing air out of the bag. 5) I have a gamma seal lid that i use instead of an ordinary lid. This also makes an air tight fit. Note; you do not have to freeze the rice as long as you follow these steps. Also, keep some smaller mylar bags and absorbers handy incase of resealing. I know this is years too late, but besides freezing, the easiest way is in large mouth quart canning jars. Vacuum seal the jars shut, and you're done. I have an attachment for my vacuum sealer that fits over small and large mouth jars. If you don't have a vacuum sealer, still, no problem. The rice will be just fine in the jars with out putting a vacuum on it. One other option is to use two containers. One large, sturdy container with a tight fitting lid, kept out of light and away from moisture in deep storage. And one smaller container, kept handy in your kitchen for use as you want it - as rarely as you use rice, maybe you can keep a couple months at a time in that container. Exposure to light and air doesn't help anything in storage, so the fewer times you open your container generally means the longer it will take to gain off flavors. Since you're only opening the larger container to refill the smaller, it is very rarely exposed to the open air and should last longer. Also, opening it rarely also means you can use better storage measures (tight fitting lid, or stored all the way in the back) that would be annoying if you ran across it every time you wanted some, but is fine a couple times a year to refill a smaller container. It seems like an old thread has been resurrected. I cook and eat rice regularly, and store it in large amounts. The typical way I have been storing it is in a large steel container with a lid. I also add a few cloves in the scattered rice. Conventional wisdom where I come from suggests that it helps keep pests like rice weevils away from the rice. I go to bakeries and sub shop to get used 5 gal plastic food grade buckets, icing and cooking oil and pickles are usualy what was in them and go to a big box store like Lowes and get a gamma lid food grade(about 8 dollars)this is a lid you press onto the bucket, a block of wood and hammer, ask store clerk if any question of instalation, This will store 25lbs of rice the cost is about 10 dollars depending what the food outlet charges for the bucket and they usely cloean them before they give them to the public. You can use what your comfortable in keeping it air tight but the gamma lid has a gastket and is air tight the screw on lid makes it easy to dispense the product this canalso be use to store other items. I plan to use plastic milk jugs in a 1/2 gallon form. Use a funnel to fill them and just poor them when needed. I always divide my large bags of rice in freezer zip lock bags - approx. 1or 2 cups per bag then put them in my freezer. I also store my flour in my freezer. Usually 3 cups per zip lock bags. I reuse large popcorn tins, the kind that prepopped popcorn arrives in. A large tin (~3.5 gallons?) is about the same size as a 25 pound bag of rice. The lid reseals nicely, and I have no problems keeping rice at room temperature for ~9 months, the time it takes me to finish a bag. If it takes you years to finish a bag of rice, you should consider buying a smaller bag. My wife uses a tall heavy glass jar. About 2 foot tall 10 inch's wide. With a glass lid. snap down lid with seal removed. For our rice. Rice should never be stored more than 2 years as the oil in it goes rancid. Kind of same idea as Chines plastic one. But glass. Philippines. I suggest wide-mouthed apple or juice plastic bottles, the 2-quart size. You can find them cheap just about anywhere. Rough Salt works very well. And also put in some wax candles. You can use caster oil . All you need to do is take one big vessel. Put rice grains in it , add some amount of caster oil in it and mix it well. And store it in Air Tight container. In India people are using Mercury tablets to preserve rice and other grains for long time. So you can try that too. All you need to do is just add few tablets in the rice and store it in its container. PS: As mercury is used here in its pure form. So its not harmful to people. But still to prevent that you can wash rice grains properly before using it. Not the answer you're looking for? Browse other questions tagged storage-method rice or ask your own question.